"An important book for all Americans about the real costs of the War on Terror. It asks the tough questions about who pays and gives us a better understanding of the war's impact on our everyday lives." "In this engrossing and Cassandra-like book, the respected Professor Joshua Goldstein tells us, just as we need it most badly, of the true 'costs' of war." "Provides an eye-opening look at an extraordinarily dangerous policy decision by the Bush administration: to cut taxes in a time of war. The Real Price of War ought to be required reading among all Americans who want their government to do the right thing." "Joshua Goldstein writes with passion, insight, evidence, and fundamental fairness on an issue that will shape all our lives." "Goldstein's argument is simple, powerfully argued, and persuasive in large measure because it rises above political rhetoric." "[A] compact and cogent study of the costs of the war on terror and how to meet them more effectively. ... In attempting to face facts as he sees them, Goldstein makes a fine example of a nonideologue at work." Are Americans in denial about the costs of the War on Terror? In The Real Price of War, Joshua S. Goldstein argues that we need to face up to what the war is costing the average American -- both in taxes and in changes to our way of life. Goldstein contends that in order to protect the United States from devastating future attacks, we must fight -- and win -- the War on Terror, and we need money to fight the war quickly and well. Goldstein critiques President Bush's promises of national security, made even as his administration is cutting taxes and increasing deficit spending. The result is too little money to eradicate terrorism and a crippling burden of national debt for future generations to pay. The Real Price of War breaks down billion-dollar government expenditures into the prices individual Americans are paying. Goldstein estimates that the average American household currently pays $500 each month to finance war. Beyond the dollars and cents that finance military operations and increased security within the United States, the War on Terror also costs America in less tangible ways, including lost lives, reduced revenue from international travelers, and budget pressures on health care and education. The longer the war continues, the greater these costs. In order to win the war faster, Goldstein argues for an increase in war funding, at a cost of about $100 per household per month, to better fund military spending, homeland security, and foreign aid and diplomacy. Bush has told America that the War on Terror is a war without sacrifice, one we can win without raising taxes. Goldstein emphatically counters these arguments, telling readers, "These truths should be self-evident: The nation is at war. The war is expensive. Someone has to pay for it." As The Real Price of War argues, we need to pay for the War on Terror today, in order to win the war -- and secure our country -- as soon as possible. 1. What Does War Cost? 9. A War without Sacrifice? 1. What Does War Cost? To get an idea what your household pays for security against foreign threats, install a parking meter in your living room, and insert a quarter every twenty minutes, 24/7. This amount � about $500/month � is what the government spends, per household, on military-related budgets including veterans� benefits and homeland security expenses. It will not bankrupt us, but it is a substantial cost. 2. 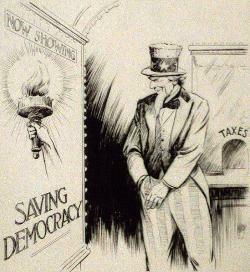 Taxes: The most important source of money for war spending is income taxes. In past wars, income taxes have increased, and more so for the rich than the poor. This time, middle-class and wealthy Americans are receiving tax cuts � and corporate and excise taxes are changing in similar ways � just as war costs escalate, leaving the war effort in peril. 3. Budget Cuts: Indirectly, military pressures on the federal budget have restrained aid to the U.S. states, which face massive budget crises far beyond what the modest federal bailout of 2003-04 can cover. Wartime thus contributes indirectly to the devastating cuts that have hit local programs and services, from schools to police and fire departments. 4. Debt: Interest payments to service the national debt, already over $250 per household monthly, will rise sharply for years to come. Running up debts in wartime is not unusual, but contributes to longer term problems, notably inflation. 5. Inflation: The number-one economic effect of war throughout history is to create inflation, reducing the standard of living. Wartime inflation typically follows after a war, as when prices rose 30 percent in just two years in 1919-20 and again in 1946-47. This time inflation should be more modest but nonetheless will reduce standards of living. 6. Business under Stress: In addition to government war spending, budget cuts, and inflation, other hidden costs of war take their toll. Wartime conditions disrupt economic growth and affect financial markets, commodity prices, investment patterns, and unemployment in complex ways that are more negative than positive overall. 7. Profit and Loss in Wartime: Although war is a net economic loss, not everyone loses or wins equally. Depending how it goes, the War on Terror could lower oil prices, benefitting big manufacturing companies, or raise them, benefitting oil companies. �Corporate America� is not a unified force either for war or against it. 8. The Price of Failure: If we do not pay the bill to defeat terrorism, a city like Chicago could be destroyed by a nuclear attack. This chapter shows how real such a threat is, and how inadequate our responses to this threat have been, at home and abroad. The country is not ready. 9. A War without Sacrifice? : Americans are in denial about the substantial war costs we face. The Bush Administration has not asked the American people to sacrifice for the war effort. But the costs will not disappear. However we fight the war, and whatever combination of military and nonmilitary means we use to win it, the war effort depends on the ability of the country to muster the needed resources and political will to pay for it. 9. Sharing the Burden: Political leadership is needed to transcend self-interested motives and inspire us to shared sacrifice, as President Kennedy did in saying "ask not what your country can do for you." This leadership has been lacking, and politics-as-usual tends to crowd out the needs of the war. 10. Pay to Win: Given the high price and risks of this war, it would be better to mobilize the full energies of the country for a few years, and decisively end the threat we now face, than to let war simmer indefinitely. Using our full energies would mean complementing rising Pentagon spending with increased funding for nonmilitary means of international influence. The country needs to face up honestly to the price of war and have an open political debate about how to divide the bill.